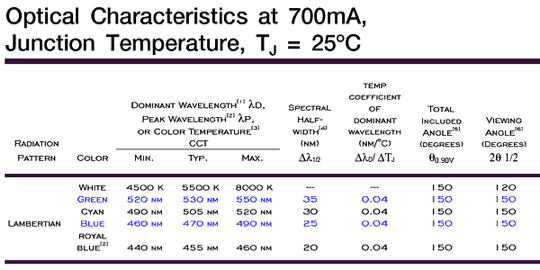 LED light sources for fluorescence microscopy. Recent advances in LED design have provided a new generation of powerful and cheap solid state light sources. We have experimented with the use of 5 watt Luxeon Lumiled devices as light sources for low cost fluorescence microscopy - these cost a few pounds each and have a lifetime > 10,000 hours. 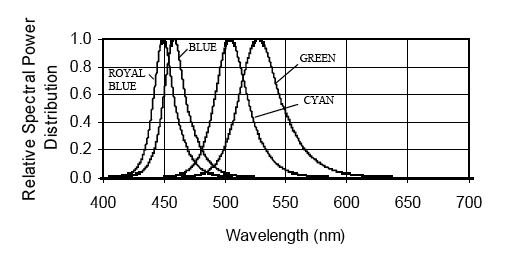 The 5 watt LEDs are available in different colours, from blue through to green, and the spectra are shown below. A series of lower output (1 watt) devices is also available, and these include a wider variety of colours including amber and red. The 5 watt LEDs are driven at a constant current of 700mA at 6-7 Volts and require a heat sink. 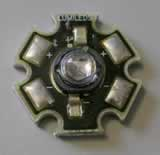 We have used the "Star" versions of the LEDs (pictured right), which include a star-shaped aluminium plate as part of the LED assembly. 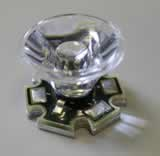 This facilitates mounting of the LEDs on heatsinks. In order to operate the LEDs at safe temperatures, the devices must be mounted on a heatsink. We have mounted the Lumiled Star LEDs using Loctite 315 thermal adhesive. This adhesive is simple to use, permanently mounts the LED on the heat sink, and provides good thermal contact. Power leads for the LEDs are then soldered in place on the solder pads provided on the PCB. We have used a variety of heatsinks designed for power transistors (right front) or PGA (pin grid array) chips (right rear). In particular, PGA heat sinks can be obtained quite cheaply (e.g. £3.50, Radio Spares). In order to attach condenser optics and to connect the light sources to a microscope light path, a threaded connecting tube is glued to the heatsink using epoxy resin or cyanoacrylate glue. We've used C-mount tubes (Edmund Optics or Linos Photonics) and the cost-effective 30mm tubes from Comar Instruments. The tubes are drilled to allow an exit for the power cables and are glued to the heatsink, centred over the LED (below). Additional extension tubes and optics can then be screwed in place. We have used a benchtop power pack (£90, Farnell) capable of supplying a regulated constant current for initial tests of the LEDs. The manufacturer recommends a supply of 700mA for the 5W LEDs. The LEDs can be dimmed by lowering the current, but the control is non-linear. An image of the power pack in action is shown below, showing the 700mA, 6.5V output. Phillips Xitanium LED driver can also be used. These are very compact and are designed specifically for powering these LEDs. They provide a suitable regulated constant current supply for a cost of around £25.